Don't go broke shooting the super fun 10mm cartridge. 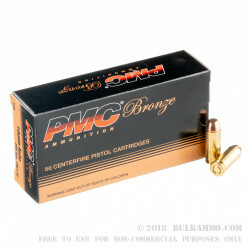 The bulk 200grain PMC load offers an excellent range cartridge at a very good price point for 10mm shooters. 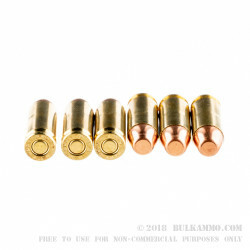 An boxer primed brass casing does double duty for the 10mm enthusiasts who reload – giving you a cheaper way to play around with handloads by collecting the spent brass. 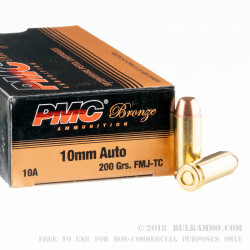 The PMC brand is manufactured in South Korea at a factory that handles all of its own component manufacturing, and which has built a solid reputation for good performance, excellent pricing and good consistency for decades in the USA. 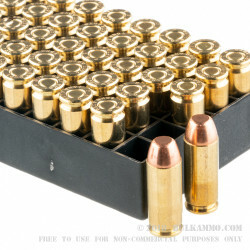 This case purchase offers a significant savings over competitor loads and makes shooting the 10mm at the range less painful. Muzzle velocity clocks in at 1050 FPS and the muzzle energy is 490 for this somewhat mild 10mm round. It is still a powerful round and is consistently able to cycle the brutish springs of the most overbuilt 10mm's available. Packed in boxes of 50 rounds and 20 rounds per case, at a price that any 10mm shooter will have to double take – it just makes sense to stock up big on this deal. Suitable for use in modern firearms marked "10mm".